Companies want their logo to be instantly recognizable, to be easily interpretable, and, in the Web 2.0 world, to be cool and hip. Overly complex logos often fail to achieve those goals. The original Apple logo showed Isaac Newton under the apple tree. Apple then moved to the rainbow apple logo (1976-1998). A monochrome version has been used since 1998 (the silver logo was introduced in 2003). Rob Janoff, the graphic designer who created Apple’s original rainbow-striped logo, apparently had created a version similar to the current logo – back in 1976, but Steve Jobs picked the striped version instead! 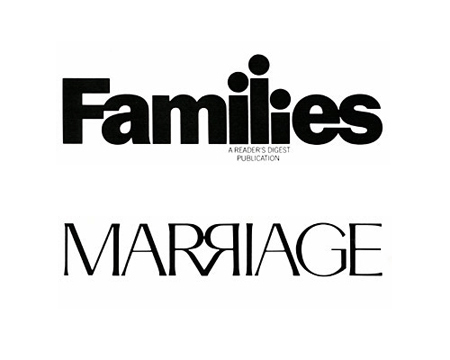 The Families and Marriage logos were designed by Herb Lubalin, creator of several well-known fonts, including ITC Avant Garde Gothic, ITC Ronda, ITC Serif Gothic. Notice the smaller second “i” in the Famillies logo. Neither has frills, shadows, color or Web 2.0 reflections, etc. Both are very powerful and meaningful. The Amazon logo is very simple and clean (the above design is the version of the logo as used from 2000 – for a pictorial history of the amazon logo, click here). The arrow, from “a” to “z” is clever – it suggests you can find anything you need at amazon.com. It is clever in another way – it represents a smile that customers would experience by shopping at the website. The IBM logo was designed by Paul Rand, who created other well-known logos (ABC, UPS). According to IBM, the horizontal stripes represent “speed and dynamism.” Notice that there are 8 stripes (8 bits?). What are your favorite simple, but effective logos?